Expand your practice by obtaining certification as an Anger Management Specialist with the National Anger Management Association! The Anger Management Institute offers National Anger Management Association approved Anger Management Specialist certification workshops! Coming March, 2018 in Texas and Illinois. Illinois Training workshops to be offered March 22-23, 2018 at Lewis University! Our DVD program is approved for 15 NBCC CE hours and 12 IAODAPCA CEUs. Phone supervision required for distance-learning courses only. New! Anger Management Institute Starter Kit for Leaders. Includes Ten Steps to Starting an Anger Management Business, group curriculum, instructions for connecting with courts and employers, assessments, inventories; 16 week leader’s guide, DVD and power point tools for groups. Order now! Includes adult and teen curriculum, 7.5 hours of Training DVDs, phone supervision to obtain National Anger Management Association Specialist credential. Order here. Or take the basic Anger Management Specialist certification program. Read about the classes, courses, DVDs, resources to help you teach anger management to others! Looking for Teen anger management Resources? New 2016 edition of the Adolescent Anger Management Book/Workbook Includes all the empirically-supported strategies for managing anger plus in-depth “what if?” application questions, how to defuse anger and hostility and deal with bullying! Teen Resources and Training: The Anger Management Institute is now offering CEUs for our Teen Anger Management course and Certification. View the Teen course here! Or consider purchasing the Teen Leader’s Group Curriculum. Includes 12 expanded teen book/workbooks, DVD, Leader’s Guide, Assessment and group tools! Adults and Teens: You can teach/treat both adults and teens by taking the 40-Hour Anger Management Trainer-Specialist Home-study Program. Includes group tools for adults and teens; leader’s guides; assessments; phone supervision (2 hours) to qualify for NAMA certification and up to 27 NBCC CEs! Steve Yeschek, LCSW, CAMS-IV and Lynette Hoy, NCC, LCPC, CAMS-V offer professional counseling, coaching and training services! Contact Lynette Hoy for anger management coaching and evaluation services, individual sessions and counseling services. Read about the Anger Management Institute group and court-ordered anger management services. 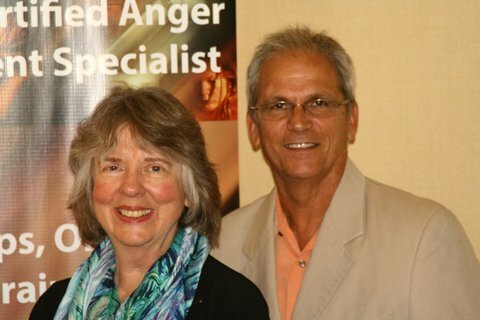 Contact Lynette Hoy about certification as an Anger Management Trainer & Specialist at: 630-368-1880, ext. 1.